Can price terms in previous LNG contracts survive the upheaval in today’s global markets? Gazprom to enter shale gas market in U.S.
EOG Canada agrees to acquire Galveston LNG Inc. Does Bradwood owe you money? Weaver's Cove said the design of the offshore berth eliminates any inconsistency with the federal designation. The company said it did not agree with the concerns raised by the NPS and asked the commission to request an explanation for the conclusions by the service. FERC today asked the NPS to provide its 2007 study report of the project “and other relevant information” to assist the commission in developing the environmental impact assessment. Webmaster’s Comments: Hess Energy/Weaver's Cove still have not complied with world LNG industry terminal siting best safe practices. See LNG Terminal Siting Standards Organization. Many suppliers, such as Excelerate, have successfully sited LNG terminals offshore. I don’t understand why Hess cannot do the same. It should be noted that in the 1950s – when the oil industry wanted to build a massive refinery in Jamestown – those who also supported that project used the same arguments to support their philosophy. They said that it would bring jobs and cheaper energy, and that it would not affect local transit. With the oil spill in Texas this month – and what we now know of refineries – it is clear that they were on the wrong side then, and they’re on the wrong side now. We can’t afford to chance our future on this philosophy. [Richard Clarke, former head of counter terrorism under two presidents] states that “LNG should never be located inland, especially in populated areas,” such as ours. Webmaster’s Comments: The parallels between the Jamestown area and Passamaquoddy Bay are striking. BP did not need much of a hard sell to convince area public officials that the proposed [LNG import] terminal would be safe. But in hindsight, BP made the same assurances about its leaking rig that caused the death of 11 workers. In November, the Hess Corp. acquired the Logan site from BP. So far, not much seems to be happening there, but Hess officials have cited the site's ongoing LNG terminal potential. (Any owner must deal with a possible redesign, since courts have upheld Delaware's ability to block construction of a necessary pier in the river). Webmaster’s Comments: Hess Energy's cockamamie terminal siting "solutions" (such as Hess' proposed 4.25-mile undersea cryogenic LNG pipeline in Mount Hope Bay, Massachusetts and Rhode Island) are too much like failed Quoddy Bay LNG goofball ideas to provide much comfort in Hess having replaced BP at Crown Landing. Oil and gas companies say there is potential for new discoveries in Southcentral Alaska but that a lack of customers, other than local utilities and a liquefied natural gas plant near Kenai, is an obstacle impeding investment in new exploration. Absent sufficient new gas discoveries, Van Nieuwenhuyse said the mine could also help make imports of liquefied natural gas possible, at least until a gas pipeline can be built to bring North Slope gas to the region. Northwest Natural Gas Co.'s annual meeting on Thursday once again became a referendum on importing liquefied natural gas to Oregon, despite the company's best efforts to distance itself from controversial projects and focus on its strong financial performance. Landowners, environmentalists and fishermen are urging the Portland-based gas utility to scrap its plans for a pipeline that was originally intended to serve a proposed LNG terminal on the Columbia River. If energy giants and their allies in the legislature thought the defeat of Bradwood LNG would lull No-LNG activists into complacency, they were proven wrong on Thursday. Close to 300 people of all ages and diverse backgrounds rallied outside the Oregon Convention Center in Portland, while Northwest Natural Gas held its annual shareholder’s meeting. Our message was loud and simple: LNG (liquefied natural gas) is bad for Oregon, and has no place in a progressive clean energy agenda. Originally, the Palomar Pipeline was supposed to connect to the Bradwood LNG terminal on the Columbia River. Climate activists and community organizers defeated Bradwood earlier this month, but NW Natural is still trying to push Palomar forward by connecting it to other LNG projects. We showed up Thursday to let the company know Palomar is a bad deal for Oregonians; not only is it a threat to the climate and Oregon’s natural landscape, it’s a bad investment as well. NW Natural’s shareholders already lost money when Bradwood LNG went down, turning the company’s investment in that project sour. Every day NW Natural stays committed to Palomar, the company is chalking up debts that have to be paid – either by shareholders or ratepayers. NEW YORK, May 27 (Reuters) - Sempra Energy's Costa Azul liquefied natural gas terminal in Baja California, northern Mexico, is expected to receive a cargo of LNG on May 29 from the Tangguh project in Indonesia, according to AISLive ship tracker on Reuters. Deliveries from the BP-led Tangguh plant to Costa Azul have been slow in recent months due to operational problems at Tangguh and low gas prices in Southern California, which have deterred shippers from sending much gas there. The US Coast Guard issued a Final Rule that revises the requirements for waterfront facilities handling liquefied natural gas (LNG) and liquefied hazardous gas (LHG). These revisions harmonize the Coast Guard’s regulations for LNG with those established by the Federal Energy Regulatory Commission, the agency with exclusive authority to approve or deny an application for the siting, construction, expansion, or operation of an LNG facility located onshore or within State waters. Japan, China and Korea have helped pick up (a little of) the slack in the LNG market created by booming U.S. shale gas production displacing LNG imports. Gazprom was downgraded Thursday to “sell” from “hold” by ING as the company may have to lower prices on increased competition from U.S. shale gas and liquefied natural gas. BOSTON— Litigation filed today in federal court seeks to expand habitat protections for the critically endangered North Atlantic right whale to include the whale’s nursery, breeding and feeding grounds. The lawsuit was filed by the Center for Biological Diversity, Defenders of Wildlife, The Humane Society of the United States, and Whale and Dolphin Conservation Society. FERC claimed jurisdiction over an LNG trucking company's sale of natural gas for resale in interstate commerce, but the commission said it would not regulate rates, charges, terms or conditions of sales directly to end users. "As a general rule, our jurisdiction over the transportation of natural gas in either gaseous or liquefied state in interstate commerce is limited to transportation by pipeline," FERC said. "However, we note that the [Natural Gas Act] is remedial in nature and Congress could not have intended to permit a transportation innovation essentially unknown in 1938 to defeat the statutory scheme devised." Webmaster’s Comments: This may portend additional regulatory requirements for Calais LNG, since they claim to want to ship LNG by truck to inland Maine locations. We have all heard that the LNG industry has a great safety record going on 50 years. While no one claims the river winds through a lush jungle inhabited by exotic creatures, it doesn’t have to resemble the Amazon to be an ecologically important river in need of protection. The Taunton River’s use as a recreational waterway is obvious, given the number of boats skimming across its surface on a typical summer day. And while people use the river for industrial reasons, it is also a natural habitat for 45 species of fish, many species of shellfish and 154 types of birds, including 12 rare species. Its shores are home to otter, mink, grey fox and deer. A proposed gas pipeline connecting Florida and the Bahamas needs a two-year extension of its in-service date to allow for delays in two planned LNG facilities linked to the project. OIL AND gas giant EOG Resources Inc. has bought 49 per cent of the Kitimat LNG Inc.’s proposed liquefied gas export (LNG) terminal from the original proponent, placing the project firmly in the hands of major players. The announcement comes on the heels of Apache Canada Ltd.’s purchase of 51 per cent of the project in January. Apache will operate the project in co-operation with EOG. EOG’s offer to purchase the shares of Galveston LNG Inc. is conditioned upon the achievement of certain commercial and regulatory milestones that Boulton described as document transfers and regulatory filings. With the Bradwood Landing liquefied natural gas terminal halted, opponents of the project this week will shift their efforts to a Northwest Natural Gas Co. pipeline that was proposed to serve the terminal. NW Natural spokeswoman Kim Heiting said even if a LNG terminal is never built at the Bradwood site, the company intends to continue with the 111-mile eastern stretch of the pipeline from Madras to Molalla, where it would connect to TransCanada’s pipeline. Thursday’s protestors, however, argue that without the LNG terminal, the pipeline has no committed gas resource and isn’t needed. Webmaster’s Comments: All 3% must be LNG developers at Passamaquoddy Bay. There are at least 67.3 trillion cubic feet of gas estimated to be in the shale rock in southern New Brunswick, enough to power 15 million homes for nearly seven decades. [I]f the resource is big enough, the company says long-term development could have it drilling as many as 960 wells over the next three decades. "It's amazing," Wall says. "The shale gas and the tight gas sand technologies that have come out in the last few years have basically changed the demand-supply curves for natural gas all over North America. Webmaster’s Comments: Additional LNG import infrastructure in the Northeast makes no sense. Calais LNG and Downeast LNG have no future. Nearly two years after construction began, the Neptune liquefied natural gas port is now operational 10 miles off the Gloucester shore, and owner GDF Suez expects its first fuel-laden tankers to arrive at the facility in August. Neptune consists of two off-loading buoys that connect ships to the underwater pipe system and only one of them has been fully tested and could accept tankers now. Webmaster’s Comments: The three new LNG import terminals in the Northeast — Canaport LNG, Northeast Gateway, and Neptune LNG — plus the current 30 expansion and pipeline projects to bring natural gas to the Northeast, provide more than 160% of the Northeast's needs for natural gas. The vessels incorporate the reinforced GTT MKIII cargo contaiment system with 145,000 cubic meters of cargo carrying-capacity at 100% volumes. 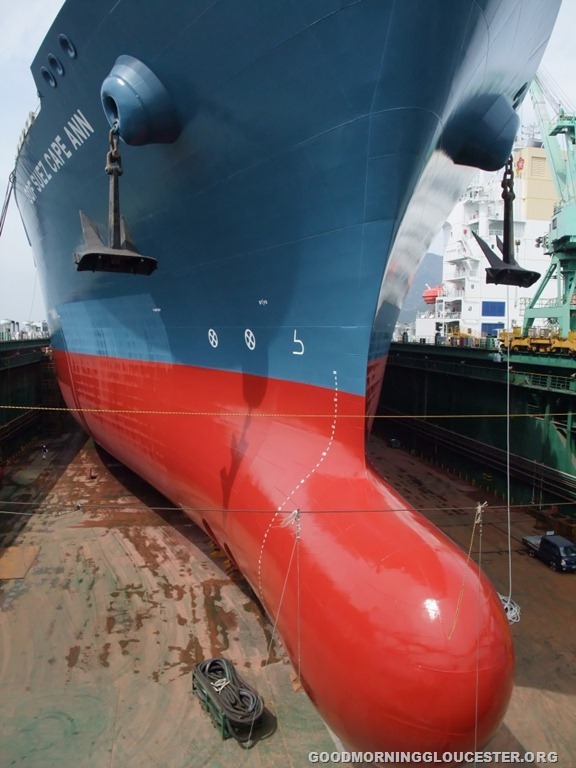 She is fitted with three state-of-the-art regasification skids for a total output capacity of approximately 21 million standard cubic meters of natural gas per day (**), and is also fully capable of operating as standard LNG carriers. Webmaster’s Comments: To get a clear idea of how massive these new ships are, take a look at the third photograph from the top of the article, also shown individually on its own page. Massachusetts Senator John Kerry, Congressman Barney Frank and Congressman Jim McGovern praised a declaration by the National Park Service that the lawmakers said Monday deals a major blow to the proposal to construct a liquid natural gas terminal at Weaver’s Cove in Fall River. More than a year after the last public hearing in Long Beach, the proposed offshore liquefied natural gas terminal is still on the minds of residents, as politicians have continued to denounce its potential construction. Last week Dominion Cove Point LNG filed responses to FERC's data request that addressed a number of post-inspection recommendations filed by the Commission. Following its annual inspection of the Freeport LNG terminal, FERC offered a list of recommendations to improve the facility. COQUILLE, Ore. — Developers of a 234-mile pipeline to carry imported liquefied natural gas from Coos Bay across southwestern Oregon got an earful from people who don’t like the prospect. Let Tuesday's election be a warning for politicians at every level of government that reverberates across the state: public officials who insist on pandering to out-of-state LNG developers at the expense of local communities may soon find themselves out of a job. As Ferrioli himself concedes, the e-mails and other documents about Foster’s involvement may show that there was no improper involvement in LNG permitting by Foster or anyone else at Justice. The best way to determine that is for Kroger to make all relevant records available for review. Kroger pledged to cooperate with Ferrioli, the Senate minority leader. And Kroger also added a new piece of information: he has asked Dale Koch, the former presiding judge of Multnomah County Court, to review Foster’s work at DOJ and to determine whether his actions related to liquified natural gas were proper. Experts thought we were running out of natural gas. Now, thanks to a new production technique, they’re saying the U.S. is a natural-gas giant, and that could change everything about the energy equation. [A]n industry-sponsored report released today says that shale-gas drilling, and its ripple effect through the economy could create well over 100,000 jobs in the next two years in Pennsylvania alone, and deliver nearly $1 billion to cash-starved state and local governments in 2011. The industry invested $4.5 billion in developing shale gas last year, leading to the creation of more than 44,000 jobs in a time of national recession and job losses, according to the report. Shale gas has more than doubled the size of North America's discovered natural gas, according to a study by IHS Cambridge Energy Research Associates. The country now has enough gas to satisfy more than 100 years of consumption. And the United States recently overtook Russia as the second-largest global producer of gas. "America has more shale gas than it knows what to do with," says T. Boone Pickens, who has made shale gas a key component of his "Pickens Plan" to turn gas into a transportation fuel. "This is simply the most significant energy innovation so far this century," said Daniel Yergin, author of the Pulitzer Prize-winning history of the oil business, The Prize. "As recently as 2007, it was widely thought that natural gas was in tight supply and the U.S. was going to become a growing importer of gas. But this outlook has been turned on its head by the shale gale." Webmaster’s Comments: There has already been a vast overbuild of LNG import infrastructure in the US — 10 operating LNG terminals, plus 16 additional terminals either under construction or already permitted. The overbuild is so great that by the end of 2009 existing LNG import terminals' output was averaging below 10% of capacity. That's over 90% of capacity sitting idle. Qatar may end up exporting just 6 million mt/year of LNG to the US after diverting as much as 20 million mt/year to other countries, Qatari oil minister Abdullah al-Attiyah said in an interview published Monday, without giving a firm timeline on when those figures would be reached. To date, Qatari LNG exports to the US have been well below those levels, reaching just 60,000 mt in 2008 and 260,000 mt in 2009. But last year the country commissioned several new LNG production trains, with more to follow this year, and much of that output had been sold under contracts to US buyers. Qatar's contracts with US offtakers allow the country to divert term supplies to other markets if it can achieve "better prices, related to oil,"	al-Attiyah said. MADRID (Dow Jones)--Spanish oil firm Repsol YPF SA (REP) from July on may ship liquefied natural gas from Peru to its Canaport LNG terminal in eastern Canada, a Repsol spokesman said Thursday. Shipments to Canada could be carried out over several months until the completion of an LNG terminal in Mexico that is slated to receive much of the shipments from Peru, the spokesman said. The Working Group has performed a risk assessment of the transits, and the findings, said Gray, indicate that the tanker transit realities with a “high” risk of adverse impacts are terrorism, bridge security, bridge traffic delays, local security, sailboat events and Jamestown ferry service (which is provided by Conanicut Marine Services during the summer). Gray also stressed that the Working Group opposition to the terminal is not driven by the risks of LNG; but, rather, the risks of delivering liquefied gas in close proximity to towns with dense populations – and in waters with a long history of coexistence among the many users of Narragansett Bay. Webmaster’s Comments: Just like Downeast LNG and Calais LNG, Weaver's Cove ignores the very standards that have helped the LNG industry achieve its current admirable safety record. By defying those standards, Downeast LNG, Calais LNG, and Weaver's Cove are thumbing their noses at safety, at their prospective neighbors, and at the industry itself. For more on the LNG industry's best safe practices — especially the ones being violated by Calais LNG, Downeast LNG, anc Weaver's Cove — see LNG Terminal Siting Standards Organization's website. In a letter distributed by the Federal Energy Regulatory Commission on Tuesday, Hess LNG asked regulators for another year to complete revisions needed to resurrect the Crown Landing import terminal plan originally developed by BP America. Changes under consideration include an attempt to build a tanker unloading berth just north of Delaware waters, avoiding state environmental and border conflicts that blocked the original project. The court case is one of three legal challenges to the project, which was approved by the Federal Energy Regulatory Commission with 169 conditions in January 2009. The Maryland Department of the Environment brought the suit against the U.S. Department of Commerce last May, pressing Commerce Secretary Gary Locke to reconsider a June 2008 ruling by his predecessor Carlos Gutierrez concerning Maryland’s coastal zone management plan. Yesterday FERC granted Cheniere's request for an extension of time to construct and place into operation the Creole Trail LNG import project and associated pipeline. The revised deadline for placing the project into service is June 15, 2011. Yesterday FERC requested environmental data from Cameron LNG regarding the company's proposal to install a back-up natural gas compressor for the terminal's boil-off gas system. When Yukon Pacific's license to build an LNG export terminal in Alaska expires on Saturday, the company will have to start the permitting process from the beginning if it ever wants to build the facility. Larry Persily, federal coordinator for Alaska gas projects, said Wednesday that the project's demise doesn't have a bearing on the North Slope pipeline proposals. If buyers exist for gas exported from Valdez, either Yukon Pacific or another developer will emerge, he said. The denial by the Federal Energy Regulatory Commission creates new questions about an option to liquify natural gas from the North Slope for shipment by sea, which is part of a proposal to build a major pipeline to bring Alaska's gas to domestic or overseas markets. Their current license to export a total of 99 bcf will expire at the end of March 2011. The DOJ, which faces a series of public records requests seeking more information on Foster's and Kroger's involvement in the LNG permitting decisions, maintains there has never been a credible allegation that Foster's work on the LNG issue was improper. Repudiation of Lee cabal, LNG funny business sweeps the court house. Bradwood, which would have been situated about 23 miles inland from Astoria on the Columbia River, is likely dead, with bankruptcy proceedings ahead to dissolve the company’s assets. A public hearing has been scheduled for May 27, 2010, in Astoria, Ore., to discuss the Oregon LNG and Oregon Pipeline proposals. Webmaster’s Comments: This is more evidence more LNG import infrastructure is unneeded. Most analysts have attributed the lack of a meaningful fall off in gas production to the increase in drilling in onshore gas shale formations. [T]otal gas in U.S. storage as of May 7 — at 2.089 trillion cubic feet — is about 18.4% above the five-year average, and 4.9% above last year’s level for the same week. Webmaster’s Comments: The United States is drowning in natural gas. Calais LNG and Downeast LNG are lost causes. Gazprom, the world leader in gas production, intends to purchase a company in the United States that produces shale gas, Deputy Gazprom Director Aleksandr Medvedev said according to Bloomberg. Medvedev did not name the company in question. Webmaster’s Comments: If true, this is just another reason to worry about Russia controlling US energy resources. Last Thursday, the Calais City Council voted to amend its Comprehensive Plan and Land Use regulations to create a marine industrial zone. “This is not specific to Calais LNG,” Barnes said, but added that it will allow projects such as Calais LNG to go forward. “If Calais LNG should not happen, we will still be ready for other such projects in the future,” Barnes said. Changes to the land use regulations, however, were opposed by at least one abutting landowner who said the scenic value of his property would be adversely affected by an LNG port. Webmaster’s Comments: Can everyone say "spot zoning"? Speaking to ICIS Heren [subscription required] last week, Dean Girdis, president of Downeast LNG, said that he hopes to begin negotiations with potential capacity holders in 2011. Girdis also distinguished the Downeast LNG project from others proposed in the region, noting that the smaller Downeast LNG project is more appropriate for the region's market conditions and existing infrastructure as compared to its larger competitors. Webmaster’s Comments: "Hopes" is the operative word. The natural gas market is already saturated. WASHINGTON – Senator John Kerry, Congressman Barney Frank and Congressman Jim McGovern today praised a declaration by the National Park Service that deals a major blow to the proposal to construct a Liquid Natural Gas terminal at Weaver’s Cove in Fall River. A provision introduced in the Wild and Scenic Rivers Act by Massachusetts lawmakers requires the National Park Service to determine whether the Weaver's Cove project or any other development proposal requiring federal funding or permits is consistent with the law. Hess LNG’s Crown Landing venture recently asked the Federal Energy Regulatory Commission to give the company a one-year extension to complete a permit application for the project, originally developed by energy giant BP. Hess told FERC officials in a letter that it had identified “a number of project design modifications which, if implemented, Crown Landing believes will allow the project to comply” with local, state and federal objections. Webmaster’s Comments: Same Hess Energy as Weaver's Cove LNG, same Gordon Shearer who is proposing a 4.25-mile underwater cryogenic LNG pipeline at Fall River. Same cockamamie ideas for Crown Landing? JUNEAU, Alaska -- Federal regulators have denied a request by Yukon Pacific Co. to again give it more time build a liquefied natural gas plant in south-central Alaska. The commission, in its denial letter last week, said environmental and regulatory standards have changed since the company first obtained a permit in 1995, and those issues need to be addressed. Webmaster’s Comments: Perhaps this is an indication that FERC is now actually considering need. HOUSTON, May 18 /PRNewswire-FirstCall/ -- EOG Resources, Inc. today announced that its Canadian subsidiary, EOG Resources Canada Inc., has agreed to acquire the shares of Galveston LNG Inc. This Calgary-based corporation, through its wholly-owned subsidiary, Kitimat LNG Inc., owns 49 percent of the planned liquefied natural gas (LNG) export terminal to be located at Bish Cove, near the Port of Kitimat, about 405 miles (652 kilometres) north of Vancouver, British Columbia. Webmaster’s Comments: North America is drowning in natural gas. CALGARY- Canada’s first liquefied natural gas export terminal will be owned by two major American energy companies after Houston-based EOG Resources, Inc. announced it is buying the parent company of Kitimat LNG Inc.
Their purchase indicates a desire to find better markets than the continental United States, which is awash in cheap gas from shale gas plays, said analyst Ralph Glass of AJM Petroleum Consultants in Calgary. The much-delayed project was originally envisioned as an LNG import terminal six years ago but the flow was reversed in view of B.C.’s gas potential and growing markets in the Asia-Pacific region. WASHINGTON, May 17 (UPI) -- BP has a track record of neglecting regulated safety issues at U.S. refineries, U.S. authorities said following an April explosion that left 11 dead. "The most serious of BP's violations involves a practice known as 'flipping,' which evidences a deliberate strategy for evading FERC regulations that require posting and competitive bidding for discounted long-term releases of capacity. "BP avoided the posting and bidding requirements by improperly arranging for serial short-term releases of discounted capacity to two BP-affiliated replacement shippers on an alternating monthly basis, an arrangement that continued for 22 months in one instance. FERC found that BP transported 24.9 billion cubic feet (Bcf) of natural gas on capacity it acquired improperly through flipping transactions. The Commission noted that this practice is 'particularly 'serious in nature' and 'warrants a substantial civil penalty.'" Even with BP's obvious contempt for regulations, FERC indicated a few years ago that BP's safety and regulatory violations would have no impact on FERC's permitting of BP's Crown Landing LNG terminal application. (BP has since sold the project to Hess Energy.) FERC publicly stated that if Adolf Hitler, Idi Amin, or Charles Manson were to apply for an LNG terminal, FERC would issue them permits if they followed the permitting procedure. Corridor Resources announced this week that a formerly abandoned well could have more natural gas than is available in all of western Canada's proven reserves. [T]he Passamaquoddy governor at Pleasant Point, Rick Phillips-Doyle, says, "From our point of view, it's over, and we're going to be moving on. I hope this ends it." Oklahoma-based Quoddy Bay LNG has lost its legal struggle to build a liquefied natural gas (LNG) terminal on sacred Indian ground between the US state of Maine and the Canadian province of New Brunswick. BOSTON (AP) - The National Park Service has dealt a major blow to the proposal to build a liquefied natural gas terminal in Fall River, saying initial information shows the project is not consistent with the federal Wild and Scenic Rivers Act. A circular patch of smooth water spotted in Rhode Island Sound this week led scientists to a surprising discovery: a quarter of the entire North Atlantic right whale population is hanging out and feeding in a spot where the endangered animals are not usually seen. For scientists, the unexpected behavior is an opportunity to try to unravel how availability of food influences whales’ behavior. They would like to understand, for example, if an environmental trigger or some other factor altered the availability of food, attracting the whales. Webmaster’s Comments: Whales follow the food. Eliminating their food by sucking it up as ballast and to cool engines by LNG carriers would reduce right whale activity in the Passamaquoddy Bay area. HOUSTON, May 14 /PRNewswire-FirstCall/ -- Cheniere Energy, Inc. ("Cheniere") announced today the closing of the sale of its 30 percent limited partner interest in Freeport LNG Development L.P. for net proceeds of approximately $104 million to ZHA FLNG Purchaser, LLC, an entity formed by Zachry American Infrastructure, LLC and Hastings Funds Management (USA), Inc. on behalf of institutional investors. Yukon Pacific Co., whose parent is transportation giant CSX Corp., in April filed a request with the Federal Energy Regulatory Commission for a three-year extension of the deadline to commence construction of a liquefied natural gas project. If granted, this would be the fifth such extension Yukon Pacific has received for its Trans-Alaska Gas System, or TAGS, project, which contemplates piping North Slope gas to Valdez for liquefaction and shipment aboard LNG tankers to Asia. Whether Bradwood’s demise is good news for Oregon Liquefied Natural Gas’ proposal in Astoria or the Jordan Cove Energy Project in Coos Bay is something of a crap shoot. At the simplest level, Bradwood’s news could mean two completely different things: Either it’s easier for Jordan Cove or Oregon LNG to get approved because there’s less competition for investors, or it’s tougher because a virulent opposition movement can shift its resources to battle the remaining two projects. The Daily Astorian reports that the Port of Astoria Commission is expected to vote on a proposed settlement between the Commission and Oregon LNG next Tuesday. The Commission held a meeting this week to discuss and hear public comments on the proposed settlement. Bradwood Landing LNG also faced legal challenges from Oregon and Washington state, Columbia Riverkeeper, the Nez Perce Tribe, Columbia River Business Alliance, Oregon Chapter of the Sierra Club, Bark and others. [T]he Bradwood development company, Bradwood LNG, filed for Chapter 7 bankruptcy. The development doesn’t end the long effort to establish a liquefied natural gas terminal in Oregon, but it certainly complicates the picture. Pacific Connecter Gas Pipeline sent notices to hundreds of property owners along a 234-mile route of their proposed pipeline, but some won't let the pipeline be built without a fight. Shale gas has destroyed demand for liquefied natural gas imports in the US, sinking cargoes into a deep freeze for perhaps the next 10 years according to a new research report by Houston-based securities analyst Tudor, Pickering, Holt (TPH). US regasification capacity is about 15 Bcfd, dispersed among nine different terminals on the US Atlantic and Gulf of Mexico coasts. “Shale gas renders US LNG imports nearly unnecessary over the next five to 10 years,” the report stated. Webmaster’s Comments: US LNG import terminals are running at just a fraction of their capacity. There are 3 more terminals under construction, and 13 more terminals already permitted. There is no justification for Calais LNG or Downeast LNG. In Saint John we are home to the first liquefied natural gas receiving and regasification terminal in Canada. Just last week Canaport LNG celebrated the completion of its third storage tank on site. With the capacity to hold 10 billion cubic feet (BCF) of natural gas, Canaport LNG now boasts the largest above-ground LNG storage capacity in Canada and the U.S. Northeast. Webmaster’s Comments: Natural gas demand in the Northeast is so well satisfied, Canaport LNG has determined to scuttle building a planned fourth LNG storage tank. In 1999, the first onshore well ever drilled by Corridor in southern New Brunswick discovered shale gas deposits but at the time technology didn’t exist to tap into this source of natural gas. A decade later that abandoned well near Elgin, N.B., known as the Will DeMille well, was revisited by Corridor and found to contain the largest concentration of shale gas in North America, Miller told members of the Offshore/Onshore Technologies Association of Nova Scotia. Apache plans to drill a sister well to the Will DeMille well next month. If the project is successful, it could mean at least 5,000 wells being drilled for shale gas over several decades, said Miller. Webmaster’s Comments: More-than-abundant natural gas is at Maine's very doorstep. The Calais LNG and Downeast LNG projects make no sense from a supply or economic perspective. Corridor now has 37 wells that are producing 20 million cubic feet of natural gas per day. Of that 20 million, about 17 million are going directly into the Maritimes & Northeast Pipeline, which stretches from Nova Scotia to New England and sweeps around Metro Moncton. The remaining three million cubic metres goes directly to the potash mine in Penobsquis, just outside Sussex. The amount of marketable gas - the chunk that can be recovered and sold to the market after impurities are stripped out - hovers between 700 TCF and 1,300 TCF, the Canadian Society for Unconventional Gas said. "Smith is merely embarrassed that he has had an enormous failure, and he's just trying to spin it to make it sound otherwise, but this project is already double dead if not triple dead," he said. "[Quoddy Bay LNG has] been killed by two federal agencies plus the tribe. His claim that the lease still exists, obviously it doesn't." On June 9 last year the Passamaquoddy tribal council cancelled the lease for non-payment. On April 23 this year the [Bureau of Indian Affairs] supported the council's decision. On Oct. 17, 2008, the United States Federal Energy Regulatory Commission suspended its review of Quoddy Bay LNG's proposal. Webmaster’s Comments: This article's headline is an understatement. The Quoddy Bay LNG project is triple-dead. Recently Neptune LNG LLC filed an application with the National Marine Fisheries Service that, if approved, would permit the company to engage in activities related to the operation of the Neptune LNG deepwater port that could affect local marine mammals. WASHINGTON (CN) - Neptune LNG, LLC plans to begin limited operation of its Neptune Deepwater Port, and has requested authorization from the National Marine Fisheries Service because operation may harm marine mammals. The agency plans to allow the operation to begin. The sea mammals affected by port activities would be the North Atlantic right whale and the long-finned pilot whale; the humpback, fin, sei, and minke whales; the harbor porpoise; the common, Risso's, bottlenose and Atlantic white-sided dolphins; and the harbor seal. Neptune already received authorization regarding harming killer whales and gray seals. Yesterday [May 11] FERC requested additional engineering information from Weaver's Cove LNG, focusing on the operations of the pipe-in-pipe LNG transfer system. Anyone still in denial over the need to convert our energy system to renewable sources and move on from fossil fuels needs only to look at the ongoing tragedy in the Gulf of Mexico to see the latest reason to act responsibly. Weaver’s Cove Energy and Hess LNG have been trying to gain approval for an LNG facility on Fall River’s shores for years. They would build an off-loading station in the middle of Mount Hope Bay and a storage facility in a residential area of Fall River, connected by a four-mile-long underwater pipe. The companies have brushed off legitimate fears of a disaster by claiming LNG’s track record ensures the fuel is safe. Transocean and BP executives have made similar claims. In fact, Transocean won the federal Interior Department’s SAFE award for “outstanding safety and pollution prevention performance by the offshore oil and gas industry” last year, and BP was nominated for the award this year. Clearly, track records don’t prevent tragedy. Webmaster’s Comments: History doesn't protect anybody. After hearing about the proposed LNG terminal at Weaver’s Cove while attending a gathering for the Jamestown Arts Center, Lynn wasted no time becoming involved in the battle against it. Wegner says the tab is likely to exceed $200,000, once he adds up the most recent work by county staffers and contractors. He says the county plans to pursue the bill in bankruptcy court, if the company doesn’t pay. He says the county would dig into a contingency fund if it’s not paid. NorthernStar has declined comment. The opposition efforts of both residents and the commissioners formed a good partnership, said Commissioner Kathleen Johnson. Commissioners did not have final say on the project but publicly opposed it. Last week, after six years of planning, NorthernStar halted its plans and declared bankruptcy, effectively ending plans to import liquid natural gas into the region. COOS BAY, ORE - The delay in the permit process for the Coos Bay LNG Terminal has Arnie Roblan looking for answers, and wondering if a secret meeting between FERC officials and anti-LNG groups had anything to do with it. The U.S. Senate Energy and Natural Resources Committee has not yet scheduled a hearing on S. 3056, a bill introduced in March that would give states more authority in the LNG terminal siting process. A committee spokesperson told Platts LNG Daily [subscription required] last week that no senator has yet requested a hearing on the measure. As Goldman’s legal problems have escalated — first with a civil fraud suit filed by the Securities and Exchange Commission, and then with a federal criminal investigation — some investors have grown increasingly anxious about the potential damage to Goldman’s reputation and business. The lawsuit, filed in U.S. District Court in New York by Ipreo Holdings LLC, accused Goldman employees of 264 incidents of unauthorized access to the computer database in 2008 and 2009. "This unauthorized access was done by defendants with the intention to steal, copy, use and/or solicit contacts and coverage information taken from the database and to use such information in furtherance of Goldman's business interests," the complaint said. A Halifax-based mining company claims it has found more natural gas in southern New Brunswick than is available in all of western Canada's proven reserves. SIPAYIK, Maine – After five years of legal struggle by a group of Passamaquoddy Tribe members, the BIA has canceled a long term lease with an Oklahoma-based developer, ending its plan to construct a liquefied natural gas terminal on Passamaquoddy Bay. The Passamaquoddy tribal council signed a 50-year land lease in 2005 with Quoddy Bay LNG to allow the company to develop the terminal. The lease was approved the same year by the BIA. But after a number of twists and turns in the process, including Quoddy LNG’s announcement in 2008 that it would postpone or withdraw its application from a state review process and stop quarterly lease payments to the tribe, the tribal council terminated the lease last June. A decision by the United States Bureau of Indian Affairs (BIA) on April 23 to cancel Quoddy Bay LNG's lease to tribal land kills the project, Vera Francis from Pleasant Point, Maine, said in an interview. The company will appeal, [Don] Smith said in a recent interview from Oklahoma City. Webmaster’s Comments: Quoddy Bay LNG is triple-dead, killed by FERC, by Tribal Government, and by the BIA. Until Don Smith can prove otherwise, his spin on appealing the BIA holds no credibility. Webmaster’s Comments: Mr. Beardsley is apparently unaware that Gov. Baldacci has been unsuccessfully "saying yes" to LNG for many years. Beardsley needs to educate himself about the LNG issue if he is to be taken seriously. The next meeting of the Coalition for Responsible Siting of LNG Facilities will be held Thursday, May 13, at 7 p.m. at Calvary Temple Assembly of God, 4321 N. Main St.
Bankruptcy filings show Bradwood Landing, a subsidiary of NorthernStar, owes money to owners of a local radio station, an office supply store, Astoria Rotary Club, a Seaside communication consultant and former Astorian Mary Louise Flavel, among many other unsecured creditors. Far from The Oregonian's downtown Portland offices, the reality in our communities -- in Astoria, in Yamhill County and across Mount Hood National Forest -- is much different. For us, this is an unprecedented victory for farmers, foresters, fishermen and conservationists. It's a victory for Oregonians who don't always see eye to eye but who banded together to protect our common values. MARION COUNTY — The future of Liquefied natural gas (LNG) in Oregon became a lot less certain last week, when NorthernStar Natural Gas announced it was suspending its Bradwood Landing project May 4 and subsequently filed for bankruptcy. NorthernStar Natural Gas had spent six years developing an LNG terminal proposal for Bradwood Landing. The company had federal approval, the blessing of the U.S. Coast Guard and a large coalition of supporters. Yet it pulled the plug on Tuesday. Oregon LNG, which hopes to build a terminal in Warrenton, and Coos Bay’s Jordan Cove Energy Project are still moving ahead with plans. Oregon LNG already has its land-use permits, but it hasn’t received federal approval. Jordan Cove has both, though the associated Pacific Connector Gas Pipeline still awaits county approval. Chris McGill, managing director of policy analysis for American Gas Association of Washington, D.C., says new technologies for extracting domestic gas are attracting attention. The Ruby Pipeline from the Rockies to Southern Oregon has received federal approval, and construction could begin as early as next year. Others are in the works. State officials seem to see those pipelines as the best way for Oregon to get its gas. To be sure, spending $100 million before ever driving a nail is a staggering sum -- one that offers a cautionary note for the two remaining LNG proposals in Oregon -- one in Coos Bay and the other in Warrenton. To reach the regulatory finish line, each of those projects still faces a daunting lineup of interdependent state, local and federal permitting processes. Cameron Horowitz, an analyst at SunTrust Robinson Humphrey, said increased domestic supplies of natural gas have slashed prices, killing the demand for LNG imports. Two other companies trying to develop LNG facilities in Oregon would face "slim" prospects of success, he said. "Every year for the past five years, there's been talk that this country would be flooded with LNG imports, but it has never come to fruition," he said from Houston. "Given the outlook for U.S. natural gas prices and the rest of the world, I don't see it coming to fruition at all over the next five years." Last year, amid controversy, the Port resisted renewing the state lease for a 30-year term, and Oregon LNG sued the agency for breaking its sublease agreement. A federal judge sided with the company in March, and the Port has filed a request to renew the state lease - which has not yet been granted. Meanwhile, the Port is negotiating with Oregon LNG to avoid millions in damages the company is claiming. The Port is simultaneously weighing its options for appealing the judge's ruling in the case to the Ninth Circuit Court of Appeals, but Tienson said an appeal could cost the Port $150,000 or more. On one hand, the deal gets the Port out of Oregon LNG's breach of contract lawsuit without further expense. The company claims the Port's leasing decision damaged their chances of building the proposed $1 billion LNG facility. The project is backed by the New York holding company Leucadia National Corp. The settlement also gives the Port the option of stepping back from its unprofitable leasing "sandwich" by assigning the state lease to Oregon LNG. "If they're wanting more land, they're wanting it for a reason," said Carl Dominey, an Astoria resident and LNG opponent. "And that reason may be because they need that land to do something. It seems to me the Port has the legal authority to say no ... and in effect could stop the project." ICIS Heren [subscription required] reports that Jordan Cove LNG is on pace to make its final investment decision in June of 2011. A company official said that the project timeline was not affected by the announcement that the Ruby natural gas pipeline, designed to transport gas from Wyoming to markets in Oregon, would go forward. Webmaster’s Comments: The Jordan Cove LNG project violates multiple SIGTTO best safe practices. Plus, it ignores natural gas market realities indicating it is too late to make a difference. Natural gasproduction continues to grow while demand remains stagnant. As a result, the amount of natural gas flowing into storage continues to grow and generally at a faster pace than most commodity experts and petroleum analysts have been expecting. The latest weekly storage injection of 83 billion cubic feet (Bcf) exceeded analyst estimates by 3 Bcf. For the week ending April 30th, total gas in storage was 1.995 trillion cubic feet (Tcf), which was 5.1% ahead of the volume in storage at this time last year and 18.8% above the five-year average. By now, anyone and everyone who pays the slightest attention to business news knows that Goldman Sachs is being sued by the SEC for deliberately and maliciously defrauding their own clients. This is enormous news, from a number of perspectives. [W]hen this case against Goldman Sachs comes before a judge, the “public policy” argument which the judge will be weighing is: when a client places his own wealth (and perhaps his “life's savings”) in the hands of any/every “financial advisor”, should the client be able to trust that advisor? It is that “public policy” argument which Lloyd Blankfein was addressing when he asserted that Goldman Sachs is “not a fiduciary”. NYSE Regulation fined Goldman Sachs May 3 for violating Rule 204T of Regulation SHO, which governs short sales. It’s the first fine related to the rule since the it was adopted in September 2008 to address the regulator’s concerns that “naked” shorting was a factor in plummeting stock prices. The fact is that Goldman and its cohorts not only have become too big to fail; they've also become too big to manage and too big to regulate. Because of this, they endanger us all. First, the Securities and Exchange Commission files a civil suit, citing fraud over mortgage securities deals. Then, the Senate publicly scrutinizes the firm's executives, including CEO Lloyd Blankfein, in a heated hearing. Next, the Justice Department and the state of New York announce they are launching a criminal investigation into the the deals. Now, Goldman Sachs has disclosed that six lawsuits have been filed by its own shareholders in the wake of the fraud allegations. And these plaintiffs aren't limited to big-name investors. According to the SEC filing, all shareholders are charging the firm and its executives with "breach of fiduciary duty, corporate waste, abuse of control, mismanagement and unjust enrichment." GROWTH in Trinidad and Tobago's liquefied natural gas (LNG) sector appears to be stalling after a decade and a half that saw it become the top supplier to the US. NorthernStar Natural Gas Inc. and NorthernStar Pipeline Company LLC of Houston have filed for Chapter 7 bankruptcy protection. Voluntary petitions were filed with the southern district of Texas Houston division of the U.S. Bankruptcy Court Tuesday. Chapter 7 bankruptcy, unlike other bankruptcy protections, is a liquidation proceeding, not a company reorganization. Clatsop County is listed as an unsecured creditor, with a claim of more than $180,000. Unsecured creditors are less likely to receive repayment than secured creditors in bankruptcy proceedings. The county has billed the company for legal and administrative services connected with the Bradwood project's land-use application, which was approved in 2008 and twice challenged to the Oregon Land Use Board of Appeals. County public information officer Tom Bennett said NorthernStar has already paid the county more than $600,000 in rebilled expenses tied to the land-use permitting process, but since last summer around $180,000 has been billed to the company and has not yet been paid. For one thing, County Commissioner Dirk Rohne said, the company owes the county around $200,000 in outstanding legal bills accrued over the course of the local land-use approval process. "We've said this project is in the public interest and they need to have it constructed within five years," said [FERC External Affairs spokesperson] Young-Allen. "If they need more time to do that they must request it, or if they are going to abandon the project they need to let us know." NorthernStar had financial backing from New York investment firm Matlin Patterson, and secured $100 million in private financing in 2007. The company had been developing a second LNG terminal off the coast of California, called Clearwater Port, but in March that project was shelved. That leaves Jordan Cove Energy Project in Coos Bay and Oregon LNG in Warrenton as the two remaining projects. Bob Braddock, Jordan Cove's project manager, said he hadn't expected the news from NorthernStar. The terminal was to have sent up to 1.3 bcfd into Northwest US markets and was one of three LNG projects proposed for Oregon. Also part of the project was a 36.3-mile pipeline. Bradwood Landing’s departure from the LNG terminal scene in Oregon leaves two other projects facing the same head winds of public opposition. The project, proposed for a site 25 miles east of Astoria on the Columbia River, included a 36.3-mile pipeline extending from the terminal to an interstate gas pipeline near Kelso, Wash. Another pipeline proposed by Northwest Natural and TransCanada would have connected the Bradwood facility to a natural gas hub in Molalla. Mike Carrier, natural resources adviser to Gov. Ted Kulongoski, told The Oregonian newspaper that a company official said the private equity fund that had put $100 million into the project had pulled the plug. The NorthernStar Natural Gas company said late Tuesday it has suspended development of its Bradwood Landing liquified natural gas import terminal near Astoria. Officials from Oregon, Washington and the U.S. Department of Justice launched a lawsuit against the Bradwood Landing liquefied natural gas terminal in March 2009. The Justice Department represented the National Marine Fisheries Service, which joined the states’ appeal of the Federal Energy Regulatory Commission’s permit approval for the terminal. The company started work on the Bradwood Landing project near Astoria six years ago with hopes of building the first deepwater port for LNG tankers on the West Coast and a pipeline to send it throughout the state. NorthernStar sought the go-ahead to begin constructing the proposed LNG terminal 20 miles east of Astoria on the Columbia River. Opponents criticize NorthernStar for wasting time and tax dollars by withholding information needed to complete the permit process. Webmaster’s Comments: Bradwood Landing LNG, like failed Quoddy Bay LNG — and now, Downeast LNG — have all failed to provide required information about their projects from permitters. COOS BAY -- Supporters and opponents of a proposed gas pipeline are starting to prepare for a Coos County hearing later this month. The Pacific Connector Gas Pipeline would serve a proposed liquefied natural gas terminal on the North Spit of Coos Bay. The Coos County Planning Department has scheduled a May 20 hearing, at which a land use hearings officer will take public comments before making a recommendation to county commissioners. The commissioners will meet Aug. 3 to review the recommendation and decide on the pipeline. Development of the US' unconventional gas resources will require a significant expansion of pipeline infrastructure. Midstream companies are stepping up to the plate, writes Anne Feltus. What a difference three years makes. In 2007, the liquefied natural gas (LNG) industry was characterised by burgeoning demand and tight supply. The dynamic had created a sellers' market that was expected to remain the status quo for the foreseeable future. What was not foreseen was the biggest global recession since the 1930s and the rapid expansion of shale-gas resources in North America. [U]nconventional gas production in the US has accelerated at an unprecedented rate over the past three years. Shale gas has been particularly prolific, with production increasing by over 5bn cubic feet a day (cf/d) – equivalent to 40m t/y of LNG – since the beginning of 2007. This has had a material effect on US gas prices and drastically reduced the outlook for LNG demand in North America. In response, suppliers have started to remarket long-term volumes originally targeted at the US to other markets. Unsurprisingly, North America's forecast LNG demand shows the greatest change, dropping by two-thirds over the 2010-20 period compared with the outlook in 2007. [W]ith domestic production rising, LNG has become even less essential to the country's supply picture. Marketed US output rose by more than 3% in 2007 and by 7% in 2008; even in 2009, production rose by 4% in the first 10 months of the year. Between September 2008 and November 2009, three BP gas and oil pipelines on Alaska's North Slope ruptured or clogged, leading to a risk of explosions…. A potentially cataclysmic explosion was also avoided at a BP gas compressor plant, where a key piece of equipment designed to prevent the buildup of gas failed to operate, and the backup equipment intended to warn workers was not properly installed. In the most dangerous of the incidents last year in Alaska, safety backstops also failed. On Oct. 10, 2009, a staging valve stuck closed at a large central compressor station in Prudhoe Bay where gas is captured for re-injection back underground. According to the congressional letter, the blockage caused gas to back up on another series of valves. A backup flare meant to burn off that collection of gas was not lit at the time, and cameras, installed so BP staff could monitor the flare's functions in real time, were not pointed in the right direction. There was no explosion; the gas vented out before anything could ignite it. Webmaster’s Comments: And yet, FERC will not take BP's negligent corporate culture into account when permitting BP's Crown Landing LNG terminal and pipeline in New Jersey. FERC told Save Passamaquoddy Bay the Commission would permit LNG terminals to Adolf Hitler, Charles Manson, and Idi Amin, if they followed FERC's permitting rules. Oil and gas production, both onshore and offshore; gas processing; gas compressor stations; underground gas storage; LNG storage; LNG import and export terminals; and oil and gas distribution would be required to report greenhouse gas emissions above certain levels. The proposed supplemental rule would require annual reporting of fugitive and vented CO2 and methane emissions from oil and gas facilities and combustion-related CO2, methane and nitrous oxide emissions from flaring at the facilities. [W]e are speaking of the huge natural gas deposits being found in southern New Brunswick. Our own government sources indicate there is an estimated 70 trillion cubic feet of natural gas in the Moncton Basin, a larger resource than is currently found in Alberta. [T]he northeastern U.S. has found huge deposits of shale gas (the Marcellus field) there and as such they are now able to supply their own needs including electrical generation at a much lower cost than in the past. This means that the northeastern U.S. is not likely to be a premium price market for electricity as it has been in the past. Canaport LNG announced Thursday the completion of its third liquefied natural gas storage tank. With the capacity to hold 10 billion cubic feet of natural gas, the Canaport terminal now boasts the largest above ground LNG storage capacity in Canada and the U.S. northeast. Among his ideas: Propose a referendum to allow the state to consider a new nuclear power plant; introduce a law to let Maine utilities once again generate electricity as well as deliver it; help speed construction of a liquefied natural gas terminal; gain the authority to explore for oil and natural gas in the Gulf of Maine. LNG is more expensive (including in environmental impact) than vastly abundant and inexpensive US domestic natural gas. When will these candidates recognize their hypocrisy? Given the potential danger of mixing cryogenically cold LNG with water, I think the people of Fall River deserve proper risk modeling — even though modeling doesn’t guarantee safety. A quick look at the aerial photographs of the oil slick spreading through the Gulf of Mexico — a slick which is larger than Rhode Island as of this writing — demonstrates the absurdity of siting a major energy facility in an ecosystem as treasured and fragile as Mt. Hope Bay. The South Shore Audubon Society has added its name to the list of groups opposed to liquid natural gas plants off the New York coast, including the proposed Atlantic Sea Island project south of Long Beach. Webmaster’s Comments: The Governor of New Jersey — not Maine's Governor Baldacci — is committed to protecting state citizens and environment. Gov. Chris Christie marked Earth Day by reaffirming his administration’s commitment to environmental protections. At the oceanfront in Sea Bright on April 22, the governor was met with applause and even drew a standing ovation as he articulated his opposition to liquefied natural gas (LNG) facilities off the New Jersey coastline and signed a bill in favor of solar power. Christie, who along with Gov. Paterson, has veto power over such projects, said LNG terminals "are not the answer for New Jersey's needs." The appeals court concluded that FERC had complied with the court's previous order by limiting the amount of regasified LNG permitted to flow onto Columbia Gas Transmission's system, from which WGL receives gas, to 530,000 Dth/d, the same volume permitted to flow through that interconnect prior to the expansion of the Cove Point LNG terminal. ANCHORAGE, Alaska -- The Alaska Gasline Inducement Act's open season officially started Friday. Gas producers can commit to buy transit capacity in AGIA's planned natural gas pipeline during the 90-day period. As Obama shuts off-shore drilling, bids open for Alaska Pipeline (Apr 30) — 24/7 Wall St. The pipeline, if and when it’s build, would carry up to 4.5 billion cubic feet of natural gas daily from Prudhoe Bay on Alaska’s North Slope to either a connection to TransCanada’s existing pipeline system in Alberta or to Valdez, Alaska, where a new LNG plant would be constructed to convert the gas to a liquid and then put it on LNG tankers for distribution. There is an estimated 8 trillion cubic feet of gas offshore of Alaska’s North Slope that would be shipped on the winning pipeline system. … If the route to Valdez is chosen, the pipeline would be about 800 miles long, but would include a costly LNG [liquefaction-for-export] train at the terminus in Valdez. A sharp reduction in imports of natural gas to the United States is also likely easing downward pressure on prices. During the report week, net Canadian imports hovered around 6.5 Bcf per day, about 3.7 percent lower than the prior week, according to BENTEK. Additionally, the pace of deliveries of U.S. LNG imports in recent weeks has decreased considerably in comparison with year-to-date levels. Sendout from U.S. LNG import terminals averaged 2.0 Bcf per day during the first 2 months of 2010, but during this report week averaged just 0.8 Bcf per day. This reduction in LNG imports is occurring at a time when many analysts had expected a greater number of LNG cargoes to be directed to the United States, following production increases in countries such as Russia and Qatar. To the extent LNG cargos have flexibility in delivery locations, supplies are instead heading to Europe and Asia, where LNG prices remain higher than those that have prevailed in U.S. markets. Webmaster’s Comments: Natural gas prices in the Northeast US will continue to lose the premium paid, compared with the rest of the US, due to the 30-plus natural gas pipeline projects that will be delivering domestic natural gas to the Northeast. There is no credibility to the argument that additional US LNG import infrastructure would reduce US natural gas prices. As noted in the analysis, AGA believes that the strength of gas supply in the U.S. is not only founded on the abundance of the methane in North America but the diversity of those supplies as well. The Potential Gas Committee now identifies about 600 Tcf of natural gas resource potential attributable to shales alone. … This recent recognition of the shale-related resource potential has increased the overall view of domestic gas supply compared to annual production from a 65- to 100-year life. In addition, some analysts who point to 8 Bcf/d of shale-gas production in the U.S. today, believe that the volume could be increased to 13-15 Bcf/d (or higher) in only a matter of years, not decades, and thus become a prominent factor in meeting future gas requirements or even growing natural gas demand. Webmaster’s Comments: Downeast LNG and Calais LNG are only fooling themselves, their investors, and their local supporters as they continue to drag along their needless projects. BP, the global oil giant responsible for the fast-spreading spill in the Gulf of Mexico that will soon make landfall, is no stranger to major accidents. In March 2005, a massive explosion ripped through a tower at BP's refinery in Texas City, Texas, killing 15 workers and injuring 170 others. Investigators later determined that the company had ignored its own protocols on operating the tower, which was filled with gasoline, and that a warning system had been disabled. Almost a year after the refinery explosion, technicians discovered that some 4,800 barrels of oil had spread into the Alaskan snow through a tiny hole in the company's pipeline in Prudhoe Bay. BP had been warned to check the pipeline in 2002, but hadn't, according to a report in Fortune. When it did inspect it, four years later, it found that a six-mile length of pipeline was corroded. Other problems followed. There were more spills in Alaska. And BP was charged with manipulating the market price of propane. Webmaster’s Comments: FERC told Save Passamaquoddy Bay, and others in the news media, that BP's corporate culture of negligence would have no impact on FERC's BP LNG permitting. Save Passamaquoddy Bay asked FERC if Adolf Hitler, Idi Amin, or Charles Manson applied to build an LNG terminal would FERC	permit them? FERC responded that if they followed FERC's rules procedures, then, "Yes," FERC would permit the terminals. The energy industry owns the regulators, regardless of how dangerous the industry is to the public. Even as it launched a gas-trading subsidiary in the Houston and set about securing regasification capacity in North America in order to deliver LNG supplies, Gazprom is learning that its ambitious plans to secure 10% of the U.S. gas market are no longer feasible in the context of the ongoing shale gas "revolution" in the United States. The boom in shale gas and unconventional gas production in the U.S. has caught most of the industry, including Gazprom, off-guard, as what only recently appeared to be a golden opportunity for it has all but evaporated. Indeed, as the U.S. has quickly gone from being a potential major market for LNG imports to self-sufficiency, those LNG supplies are increasingly finding their way to Europe. Webmaster’s Comments: Count Calais LNG and Downeast LNG with "most of the industry" that was caught off guard. Their opportunity not only evaporated; but, due to their inept lack of due diligence regarding transiting LNG through Canada's waters, the opportunity was never there. Goldman Sachs, once the most revered name in global finance, suddenly has become the demon prince in the dark art of financial sorcery. Incredibly, the gravity of the situation has yet to sink in to Lloyd Blankfein, the besieged head of Goldman Sachs, and his senior management team, all of whom appeared before a US Senate hearing this week with performances so woeful that they beggared belief. Webmaster’s Comments: Goldman Sachs is the money behind Calais LNG. The repercussions of business dealings by Goldman Sachs – the so-called “giant vampire squid wrapped around the face of humanity” – continued to be felt across the world from Senate hearings in Washington to financial crises in Greece and difficulties for the euro. As Goldman Sachs bosses attempted to explain to American senators how legitimate it was for them to bet against the products they urged their own clients to buy, Royal Bank of Scotland said it would have to await the outcome of the SEC case against Goldman before deciding its own course of action. How much trouble is Goldman Sachs really in? One answer: About $21 billion worth. That’s how much the vaunted Wall Street bank has lost in market value since it was engulfed in a fraud accusation two weeks ago. The criminal inquiry has been under way since early this year, the official said, before the S.E.C. filed its action on April 16 but months after Goldman learned of the civil investigation. [A]s the attack against the legendary New York firm, which is now worth $83 billion, develops into a larger disgrace day-after-day, it becomes clear that it is also managing to do our nation immense harm across the world. [W]hat decent person would not be deeply repulsed by the front page story in The Washington Post last week which told how Goldman Sachs' top executives cheered in their offices as the U.S. housing market began its extraordinary historic fall three years ago? They, after all, were going to be rich, while the rest of us ...? Well, who exactly are those "rest of us," anyway? Only those people who make up the country which makes their investments possible, that's all. Webmaster’s Comments: The City of Calais and other supporters of Calais LNG might want to take another hard look at who backing that company.